Isn’t it wonderful when a rainbow suddenly appears in front of you? Have you ever thought, how is rainbow formed? What makes the color in rainbows? Rainbows are one of nature’s most beautiful phenomena. Rainbow is an arc of spectrum colors that appear opposite of the sun in a heavy falling rain. Rainbow appear during rain showers in the presence of bright sunlight. These weather conditions can cause white light to split into its full spectrum of colored light. We can see it because the sunlight travels through water droplets and is split into seven colors: red, orange, yellow, green, blue, indigo and violet. Sunlight is a combination of different colored light. Light moves in straight lines. When light moves from one substance to another, it bends. The answer to the question how is rainbow formed: Light from the sun enters the raindrops, and because the density of the rainwater is different from the density of the air, the sunlight refracts, that is, it bends slightly. When the light bends, it splits into a spectrum of colored light because different colors of light refract at slightly different angles. 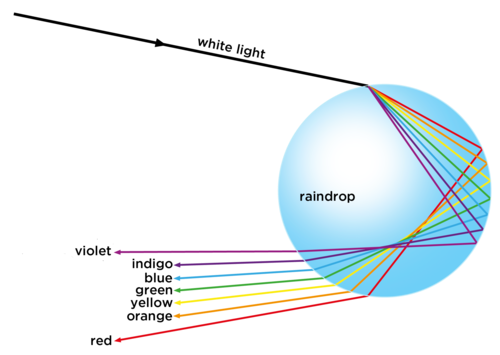 Some of this colored light is reflected back off the internal surface of the raindrop, similar to a mirror. When we see this reflected light, the reason that we see each color separately is that each color of light bends back out of the raindrop at a slightly different angle, so we see all red light at an angle of 42 degrees between us and the sun, and all violet light at an angle of 40 degrees between us and the sun and the other colors at angles between 40 and 42 degrees. These colors reach our eyes causing us to see a rainbow.